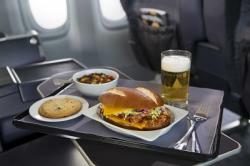 CHICAGO, Feb. 25, 2015 /PRNewswire/ -- United Airlines will introduce new premium-cabin dining service on United Express flights beginning next week, featuring freshly prepared entrees served on chinaware and expanded meal-service times for United First and United Business customers on regional flights. These dining improvements are part of United's previously announced multi-million-dollar investment in in-flight food service. The new meal service will be introduced in phases by aircraft type, with the new menus available on United Express North America flights operated with Embraer E170 and E175 aircraft beginning March 1, and on Bombardier CRJ700 and Q400 aircraft beginning in April. New breakfast, lunch and dinner menus designed by United's team of chefs will be offered on flights of more than two hours and twenty minutes. Breakfast flights may include a fresh fruit plate served with cereal, creamy Greek yogurt and breakfast bread. Lunch and dinner will feature two freshly-prepared entree choices that may include an artisanal pretzel roll filled with tangy barbecue chicken and coleslaw paired with a tri-color quinoa side salad; or ginger and garlic marinated beef with pickled vegetables and crisp edamame, served with Asian sesame dressing and a side of fresh fruit. Flight attendants will serve signature triple chocolate chunk cookies as dessert on lunch and dinner flights. On flights of less than one hour, gourmet biscotti will be served on early morning flights and a premium fruit and nut snack mix will be served on later flights. The airline is also adding light refreshments to flights departing between 1:30 p.m. and 4 p.m. and after 8 p.m.
"These freshly prepared restaurant-quality meals and expanded meal and snack services more closely align the United Express in-flight experience with our new mainline service, which is proving very popular with our customers," said Lynda Coffman, United's vice president of food services. More information on the new United Express food and beverage offerings is available at united.com. A photo of the barbeque chicken and coleslaw sandwich is available at here. The airline is continuing improvements to the United Express inflight experience by outfitting more than 200 E175, E170 and CRJ700 regional jets with Gogo's ATG-4 advanced air-to-ground Wi-Fi product. By mid-2015, United expects to complete installation on these aircraft. Additionally, the company will begin providing Personal Device Entertainment on these regional jets this year, offering customers hundreds of complimentary movies and television shows to view on their Apple iOS and Android devices using United's mobile app, as well as on laptop computers. In mid-January, United Express carriers began recycling on board E175 aircraft, furthering United's Eco-Skies commitment to operating sustainably and responsibly. These E175 flights originate from Houston, Chicago and San Francisco. These flights follow the same recycling program currently in place on United's mainline fleet, using United Eco-Skies recycling bags for recycling paper, aluminum cans, plastic bottles and the carrier's new hot beverage cups. The hot beverage cups - introduced in 2014 and boarded on all E175 flights - are recyclable and made in the United States from 50 percent recycled materials. United Airlines and United Express operate an average of 5,055 flights a day to 373 airports across six continents. In 2014, United and United Express operated nearly two million flights carrying 138 million customers. United is proud to have the world's most comprehensive route network, including U.S. mainland hubs in Chicago, Denver, Houston, Los Angeles, New York/Newark, San Francisco and Washington, D.C. United operates nearly 700 mainline aircraft, and this year, the airline anticipates taking delivery of 34 new Boeing aircraft, including the 787-9 and the 737-900ER. United is also welcoming 49 new Embraer E175 aircraft to United Express. The airline is a founding member of Star Alliance, which provides service to 193 countries via 27 member airlines. More than 84,000 United employees reside in every U.S. state and in countries around the world. For more information, visit united.com, follow @United on Twitter or connect on Facebook. The common stock of United's parent, United Continental Holdings, Inc., is traded on the NYSE under the symbol UAL.